located across the river near Old Cross. Approaching Maidenhead Street from Bull Plain and Salisbury Square, the first yard you will come across, on the right-hand side of the street, is Dolphin Yard. It is so named because its location is near to the site of a former public house, the Glove and Dolphin Inn, which used to be situated in Maidenhead Street near where Poundstretcher is now (and where Woolworth’s used to be). The inn, which was owned by Mr William Johnson of Hertingfordbury, was first recorded in the early 17th century and remained in existence until c. 1768. 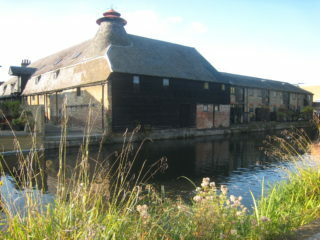 In the 18th and 19th centuries a large maltings and its associated buildings could be found in Dolphin Yard, which had access to a wharf on the River Lea at its far end. In the 1895 edition of Kelly’s Directory of Hertfordshire there is a reference to a corn dealer (and baker), Mr William Grummitt, who had warehouses in Dolphin Yard and also at Old Cross. 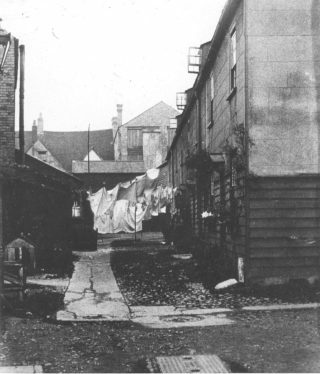 In the early 19th century there were also a number of small dwellings in Dolphin Yard, all tenanted and by all accounts of poor quality, with few amenities and little in the way of sanitary facilities – communal WCs and taps at one end of the yard were the norm in such places. A report dated 1850 listed six houses, occupied by 24 people, with just ‘1 privy over a dunghill’! 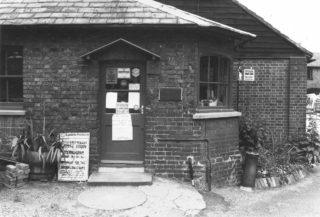 By 1903 there were seven brick cottages in the yard, three of which had WCs, as well as stables and outbuildings, and by 1930 two additional dwellings were listed in a local street directory. Closed off and neglected in more recent years, Dolphin Yard was eventually cleared and opened up to the public in 2012 and now leads to the new Hertford Library. It can also be reached from Bull Plain, opposite the Hertford Club, where it provides access to a number of new homes that have been built overlooking the River Lea and the Upper Winding Basin. 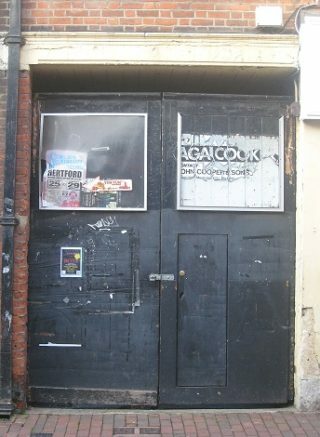 Further down Maidenhead Street, on the same side, is Adam’s Yard, identified by an archway with large wooden doors but currently with no public access. Like Dolphin Yard, this area once consisted of tenement buildings occupied by the poorer residents of the town and no doubt the houses were in a similar unsanitary state. Despite the sub-standard nature of their homes, however, there was often a strong community spirit amongst the residents of these yards. An archaeological excavation carried out in this area in 2010, as part of a planning application for a proposed development, revealed that Adam’s Yard was the possible site of a 19th-century malt kiln. Other records also indicate that there was a former malthouse here, and indeed this area of the town once had numerous buildings associated with the malting and brewing industries. In the 19th century Hertford was a major centre for malting and brewing, thanks to the high-quality barley that grew so well in the fertile soil of the surrounding countryside, and because easy access to the River Lea from the various wharves in the centre of the town provided a very efficient way of transporting the malt on barges to the breweries of London. The trade directories covering the 19th century list a number of malting businesses in Hertford, operating from different wharves in the town. These include Edward & Robert Lawrence, corn merchants and malsters at Old Cross Wharf; John Harrington & Son, malsters at Folly Wharf; and J. Gripper, Son & Wightman, corn and coal merchants, malsters and wharfingers [wharf owners] at The Wharf (Cowbridge). Currently the main area comprising Adam’s Yard, behind Maidenhead Street and adjoining Maidenhead Yard, is screened by hoardings and is still awaiting development – several flats, houses and a couple of commercial buildings have been proposed for the site, which would extend right through to the River Lea. There is no longer any obvious sign of Maidenhead Yard (sometimes called St Nicholas Yard) from Maidenhead Street, but it is still tucked away behind the shop fronts and can be accessed from The Wash near the Seed Warehouse. Originally, however, it could be reached from Maidenhead Street where formerly the Maidenhead Inn was situated (and where Poundstretcher is today). This inn was built in the 17th century (c. 1621), on the site of the medieval St Nicholas churchyard, and survived until 1933 when it was demolished to make way for Woolworth’s shop. The church of St Nicholas was demolished in c. 1675, but its font was rediscovered in c. 1700 and moved to St Mary’s church in Tonwell, just north of Hertford. On some early maps the section of Maidenhead Yard nearest to The Wash is called Nicholas Lane, which suggests that it may once have been a continuation of the Nicholas Lane near Old Cross (which still exists), where it is believed there used to be a ford across the River Lea. 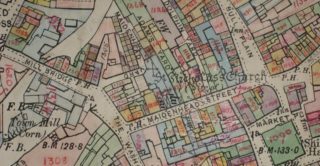 In the early to mid 19th century there were up to 20 buildings in Maidenhead Yard and according to an 1850 report these were occupied by about 84 people, so conditions must have been pretty crowded. Like those in Dolphin’s Yard the houses were small and lacking in most sanitary facilities – there were just 4 privies in the yard for all the inhabitants! Some essential improvements to the houses were eventually made in 1935, with water laid on, sinks installed and ventilated cupboards supplied for storing food. 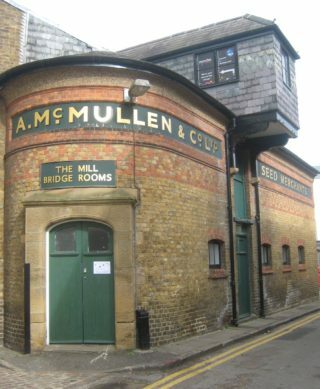 As you approach Maidenhead Yard today from The Wash, the first building you see is the distinctive mid 19th-century Seed Warehouse, founded by Alfred McMullen after he retired from the family’s brewing business. This historic building, now Grade II listed and currently used as a storage facility for Hertford Museum and for the offices of the Hertfordshire Archaeological Trust, was formerly used by merchants for storing seed and grain – to the right of the main entrance you can still see the original loading bay projecting from the wall of the building. Today there is a small housing development beyond the Seed Warehouse on the right – the sign for the yard is on the wall of the first building – and further development (including Adam’s Yard) is proposed for the area behind the Seed Warehouse. Although located a little distance from Maidenhead Street, Barber’s Yard was also near to the River Lea and so could perhaps be referred to as a Riverside Yard. It no longer exists as such, but it used to be located at Old Cross Wharf and was accessed from Nicholas Lane, near the old library. 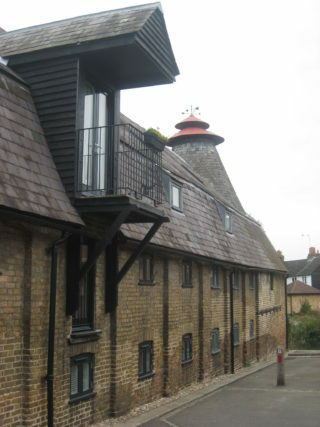 The former malthouse that is still situated here dates back to the 18th century (with traces of earlier brickwork from the 16th or 17th centuries) and its distinctive conical kiln roof and cowl have been preserved and are still evident. 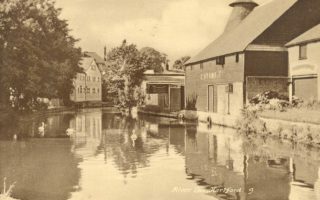 The maltings in Barber’s Yard was one of the oldest in Hertford and it remained in use until the end of the Second World War. The malting process involved soaking barley in water to start the germination process and then, when the barley began to sprout, laying it out to dry on mesh floors, which were situated above a kiln on the floor below. Other buildings on the site in Barber’s Yard included a grain store, stables, a cart shed and a tally house. In the mid 19th century and the early part of the 20th century the premises were occupied by Charles Adams & Co., millers, corn and seed merchants. This name can still be seen on the weatherboarded side wall of the building overlooking the Upper Winding Basin, although it has now been painted over. In recent years (c. 2005) the building, which is Grade II* listed, has been redeveloped for residential use and now consists of several apartments, but the essential character of the malthouse has been retained, as can be seen in the two photographs here. The original drying kiln has also been conserved. This page was added on 12/08/2015. Life was certainly grim. Mid 19th century, the Clerk to the Hertford Union, Mr Sworder, commented that there were certain areas of the town of Hertford where there were most cases of epidemic and contagious diseases (cholera and diarrhoea). Maidenhead Yard was one of them. The full details can be found in a report in 1849 to the Board of Health by William Ranger, the Board’s Superintending Inspector. (HALS/Health 3/Public Health 614.094, 1849).